Huma and Hillary probably discussing who has the better husband. Huma Weiner Divorce Is Off!!! — Happy news!!! Huma Abedin is calling off her divorce to ex-Democrat Congressman Anthony Weiner. Their marriage hit a rough spot when Anthony was sentenced to prison for sending obscene pictures of himself to a young girl. This is good news as they were obviously in love. They shared everything. Even laptop computers when Huma was Hillary’s top aide!!! Is the reconciliation due to Huma’s returning to her strict Islamist upbringing and recognizing Little Tony as her rightful lord and master? Her parents were big in the Muslim Brotherhood after all. Or is it because under U.S. law spouses can’t be compelled to testify against each other? Regardless, our hearts are warmed. Look for their story to be depicted on the Hallmark Channel next Ramadan. Huma Abedin Taqiyya Practitioner? — The FBI’s reopening of its investigation into Hillary Clinton is based on what was found on the laptop computer of disgraced Congressman Anthony Weiner according to reports. Weiner is the secular Jewish husband of devout Muslim Huma Abedin who has been Mrs. Clinton’s top advisor since her Senate career. Weiner and Abedin were legally separated in August after Weiner’s latest round of sexting perversion. This also brought forth an FBI investigation of Weiner as one of his lewd texts was sent to a 15-year-old girl. 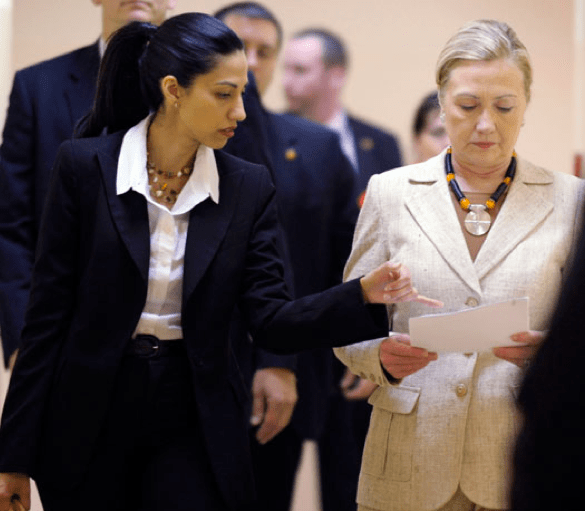 Abedin is the daughter of people connected to the Muslim Brotherhood, an organization that seeks to place the entire world under Islamic law by whatever means including terrorism. While the establishment has poo-pooed these connections others are asking “what the fool” is going on. These cynics even bring up the possibility that Abedin is practicing Taqiyya, which is the principle of lying to non-believers to advance the cause of Islam. This includes gaining the trust of non-believers in order to draw out their vulnerability and defeat them. Two days before the scandal broke it was revealed that Abedin overrode standard security protocols during trips to the Middle East, and personally changed procedures for handling classified information, including highly sensitive intelligence briefs the CIA prepared for the president. Again, you can say this is just some strange coincidence and “there has to be a logical explanation” or you can do what it takes to keep these people from taking power. This means voting for Donald Trump on Nov. 8. By the way, The Donald — unlike Hillary — has never been the subject of a criminal investigation at any point in his long and controversial career. Author BillLawrencePosted on October 29, 2016 October 29, 2016 Categories Huma Abedin3 Comments on Huma Abedin Taqiyya Practitioner? Huma and Hillary. We dare call it treason. Traitor Hillary Clinton — We dare call it treason. Maybe it’s because, unlike Wall Street and their large stable of cronies in the political class, we are not prospering from it. Anyone who fails to vote for Donald Trump is helping put a person in the White House who has sold out this nation’s interest and is going to do so again. Are we being too tough, mean and extreme on Hillary Clinton? Here’s the definition of treason. OK, help us out. Why did Mrs. Clinton have a private email server? Why would she violate government protocols and go through personal expense for this server. We’re sure there is a logical explanation. OK, there is. She didn’t want anybody checking up on what she was doing. Why? There is a logical explanation for that too. Why did she and her husband set up the Clinton Foundation? To help poor people in Haiti? OK, why did the Russians contribute to it? Because they cared about the poor people in Haiti? LOL. How exactly was the surrender of our uranium resources to them in our interests? Hillary was Secretary of State when it happened. Does the failure to develop things like the Keystone Pipeline and end Mideast oil power permanently have anything to do with the money Mrs. Clinton obtained from the region? Guess everybody cares about the poor people of Haiti. At the start of Mrs. Clinton’s tenure as Secretary of State there was a popular uprising in Iran against the Mullahs. The U.S. opposed it. What was up with that? Two years later there was an uprising in Egypt that resulted in the overthrow of our ally Hosni Mubarak and which put the Muslim Brotherhood in power. Clinton and the rest of the Obama Administration supported it. In 2013, the Egyptians got sick of the Brotherhood and kicked them. Clinton and Obama didn’t like that. Did you know that Clinton’s top advisor Huma Abedin has close family ties — including Mom and Dad — to the Muslim Brotherhood? Oh, let’s not talk about that. Bill and Hillary Clinton have prospered since Bill left office. Their combined net worth is over $120 million. This nation deserves to suffer if it puts a traitor in the White House. Vote Donald Trump. Huma Abedin Protected Weiner — This article originally ran July 25, 2013 and it is poetic that its three-year anniversary falls on the start of the pageant for the coronation of Queen Hillary as the Democrat Party presidential nominee. So we are running it again. Huma Abedin stood meekly by, July 22, as her man, disgraced Congressman Anthony “Hey Everybody, Look At My” Weiner, made a last ditch bid to salvage a chance to be mayor of New York. So why? She was Deputy Chief of Staff to former Secretary of State Hillary Clinton and helped guide policy in Egypt, Syria and the Mideast. She’s now part of the transition team to the woman who might become the next president of the United States. Why is she putting up with this bozo? And why aren’t the Islamic nutjobs threatening to kill her? Weiner is a Jew for Pete’s sake. A Jew who is humiliating her before the world; who is turning her into a joke. How can her family bear the shame? Her father, Dr. Syed Zainul Abedin — thank Allah that he’s not alive to see this — worked for terrorism financier Abdullah Omar Naseef. Her mother, Saleha, is a leader in the Muslim Sisterhood, which is the ladies auxiliary for the Muslim Brotherhood. Oh, the pain and shame she must be going through. I wonder why she doesn’t seem more upset. Huma is the one on the left. A Tea Party In Brooklyn — Republican Bob Turner, who ran as a Tea Party supporter, crushed Democrat opponent David Weprin in a special election last night (Sept. 13) to take the 9th District New York congressional seat that was once held by ultra-lefties Chuck Schumer and, most recently, Anthony “Little” Weiner. A Republican has not won there since 1920. It was a rout with Turner getting 54 percent of the vote, almost the percentage Obama got when he won the district that consists of parts of Queens and Brooklyn, in 2008. So, does Allyson Schwartz, the ultra-left, secular Jewish, one-time abortion clinic executive director who represents Pennsylvania’s 13th District, feel someone walking over her grave? And speaking of Montgomery County, parts of which are represented by Ms. Schwartz, Tea Party activist Bob Guzzardi points out that businessman Steve Welch, who is seeking to be the GOP’s answer in 2012 to incumbent Senator Little Bobby Casey, was a strong supporter of leftist Congressman Joe Sestak and voted for Barack Obama in the Democrat Primary, albeit he says he voted for John McCain in the general election. It’s good that you saw the light, Steve, but there are other potential candidates who saw it sooner and see it brighter and those are the ones that thinking people will want.